Home News Reports Has enrollment increased because of RTE as claimed by MoS at MHRD in his parliament answer? The act also promises that the per-student expenditure will be reimbursed to unaided private schools. However, media reports suggest that the reimbursements are not being received by schools in time. In addition to this, arbitrary amounts are fixed as the reimbursement as per media reports. Thus private schools have now come under bureaucratic control, thereby affecting their finances and operation. This provision to reserve 25% of seats for economically weaker sections, does not apply to institutions run by minorities as per the act. The act has transferred the significant share of responsibility of providing quality education to children from the government to the private sector schools run by Hindus. This act has also reduced the pressure on officials to improve facilities and quality in existing government schools. (a): Yes, Madam. The Right of Children to Free and Compulsory Education (RTE) Act, 2009, mandates that every child of the age of six to fourteen years shall have the right to free and compulsory education in a neighbourhood school till the completion of his or her elementary education. The Sarva Shiksha Abhiyan (SSA) Programme has been designated as the vehicle for implementing the provisions of RTE Act, 2009. Since inception of SSA in 2001, there has been significant progress in achieving near universal enrolment. As per UDISE 2015-16, enrolment of children in elementary schools has increased from 18.78 crore in 2009-10 to 19.67 crore in 2015-16. However, an analysis of the number of enrollments before and after the RTE act by Twitter user Hariprasad (@pranasutra) reveals that the answer is not entirely correct. 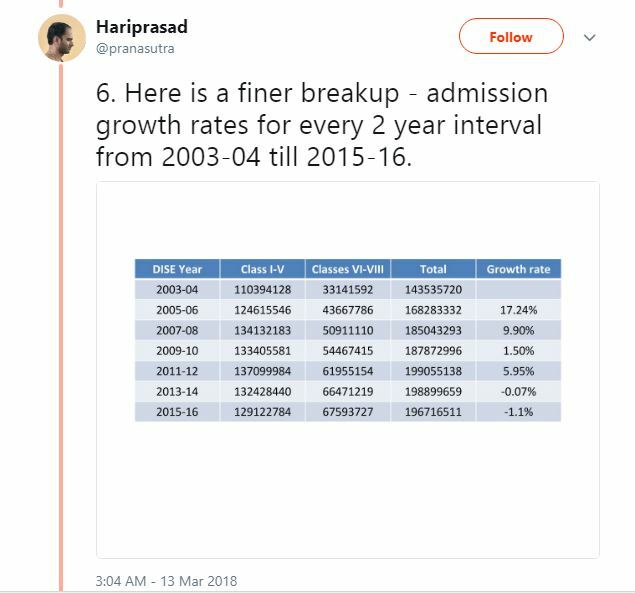 After comparing the numbers he came to the conclusion that the growth rate in admissions had actually fallen rather than risen in the said years. The source referred to by him is the same as that of the minister. The links to the same are available here. He went on to say that the decline in admission rates had been attributed to falling of population growth. Though it may or may not be true, it is clearly wrong to attribute the growth in the number of admissions to RTE Act. The minister may have misled the house on the matter. 10. In summary – MHRD has used DISE numbers to claim admissions have increased due to RTE. That claim is false. The claim that RTE has led to an increase in enrollments seems to be false prima facie. The rise in numbers is more likely to be the result of the annual increase in the number of children entering primary education. Meanwhile, the most significant impact of this act has been its bias towards schools run by minorities and interference in the functioning of schools run by Hindus. Thus the bias in this act against Hindu educational institutions must be rectified as soon as possible.